Top Uses of RFID in Industrial Environments - Informs Inc. Even though RFID gets a lot of attention, many companies are unclear about the benefits they will enjoy by using RFID. 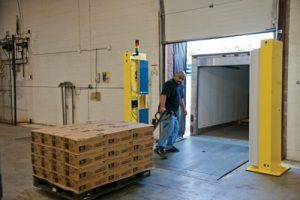 Here are a few key ways to use RFID tags and scanners to improve productivity, efficiency, and accuracy in industrial environments such as warehousing, manufacturing or distribution. Most industrial environments strive to reduce or eliminate downtime, so it can be disruptive and frustrating when necessary tooling, fixtures, jigs and required supplies aren’t readily available when it’s time for a setup. Using RFID tags on tooling helps ensure you always know where it is. Scanners at the entrance of the tool crib automatically track when tooling leaves the area, and barcode scanners can locate the missing item if it was not returned after its last use. Rapid location of missing items helps reduce or eliminate delays in setup, decreasing unnecessary downtime and increasing production throughput. Using RFID tags on inventory streamlines every aspect of inventory management. For example, you may be able to perform a complete physical inventory by having every item in the warehouse signal its presence. This eliminates a costly and tedious process. Using RFID tags also helps reduce theft and pilferage, because scanners automatically record the movement of tagged items whenever they pass out of a secure location. This added layer of security helps reduce inventory shrinkage and increases margins. In addition, since inventory and other data records will be more accurate, you may be able to reduce or eliminate safety stocks. If you rent out items, RFID tags can perform the time consuming and tedious check-in and check-out process. Making this process fast and painless for customers increases their satisfaction with your service, and accurate records that can’t be faked or misread helps eliminate disputes about the length of a rental period. Tracking serialized goods can be challenging to track, even with barcodes, because it typically requires each item to be scanned individually. RFID scanners can capture an entire pallet of serial numbers as the pallet passes the scan point, so the pallet moves faster. This reduction in move time speeds up on-time delivery by reducing the order cycle time. It also increases inventory accuracy by eliminating incorrect serial number entries and enables tighter controls with less effort. The same principle holds true for items with expiration dates or if you manage your inventory using either LIFO or FIFO picking. The RFID tag automatically lets the system know which item best meets the picking criteria and directs the worker to select that item. If your product mix varies so that you ship mixed pallets, RFID tags will speed up transaction processing, because the scanner can read the RFID tag for every item on the pallet in a single pass, even if they are lot or serial controlled. This is much faster than entering each item’s data individually. Want to know more about RFID? Watch for our NEW E-book Coming Soon: Is RFID is Right for My Business? Learn about the requirements, investment, and what types of operations could benefit most from an RFID tag and scanning system. Contact us today to reserve a free copy.